Trading the forex market is extremely difficult especially if you are relatively new in this industry. There are many traders in the world who are making a consistent profit out of trading the financial instrument in the forex market. Those who are making a consistent profit has gone through many difficult stages and after serving a hard period time they are now consistently profitable. If you are truly committed to becoming a successful forex trader then you must develop some of the basic criteria that every successful trader have. There is saying in the forex market that always trades in favor of the prevailing trend. Many rookie traders blindly follow this proverb and end up losing a huge amount of money since they even don’t realize that the trend in the forex market is subject to change. For instance, the novice traders keep on executing new buy order in the market even after the long-term prevailing bullish trend has been changed in the market. So how do avoid this type of scenario? In this article, we will teach you how to identify the trend reversal in the market like the professional traders. But before we go deep into this matter we must have a clear understanding of the market movement. In general, the market can move in three directions. The market will go up or down or will remain confined in the region which is often called the ranging movement of the market. Always remember that most of the profit is made in the trending markets and experts always wait patiently to execute their trade in favor of the long-term prevailing trend. Identifying the prevailing trend is very important for the forex traders since it will save a huge amount of your trading capital in the market. In an uptrend, the market will make series of higher high associated with higher lows in the chart. And in the case of a downtrend, the market will make series of lower highs associated with lower lows in the market. Highs and lows in the market are identified by the significant swing in the market. Let’s see the formation of trend. In the above figure, the left side of the figure is a classic example of uptrend whereas the right side indicates downtrend formation in the market. If the market moves without showing these character tics in price movement then we will assume that there is no prevailing trend and the market that is the movement of the market is in sideways or ranging move. But always make sure to use the higher time frame while identifying the prevailing trend in the current market. In the eyes of trained professional, the daily chart and the weekly chart is the best ideal time frame for identifying the prevailing trend in the market. Let us see how the professional traders identify the potential trend reversal in the currency pairs. In the above figure, the professional traders identify the prevailing bullish trend in the market since the market moves smoothly by making series of higher highs associated with higher lows. Experts use the higher lows in the market to draw the trend line in the currency pair. In the above figure, the market breached the trend line support and trades get cautious since such a breach of the trend line support is a clear indication of the trend change in the market. 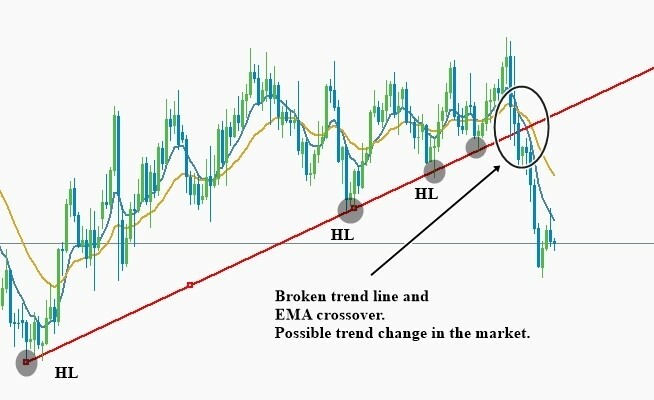 Once the market breaks the trend line support then the traders use the EMA crossover technique for the trend change confirmation. In the above figure, professional traders use the 8 and 21-day ema for identifying the possible trend change in the market. When the 8 days EMA crosses below the 21 days EMA it is considered to be bearish trend change in the market and when the 8-day ema crosses above the 21-day EMA it is considered as the bullish trend change in the market. So in an uptrend, we will use the bullish trend and bearish crossover of the EMA to identify the potential trend change in the market. Similarly, in a downtrend, we will use the bearish crossover and bearish trend line resistance to identify the potential bearish trend change in the market.